With typical items like candies and chocolate, plus special items like Alaska themed foods and baskets, this is a great option for some. With so many Gift Basket companies charging extra for shipping to Alaska, it only made sense for a company to blaze a trail into Alaska itself, eliminating the hassle of high shipping costs. That’s exactly what The Gifted Basket did, and now they serve many customers throughout the Anchorage region and the rest of the United States. A Gift Basket retailer operating out of Alaska offering baskets with a variety of themes and products. The Gifted Basket has some variety, but it’s really not up to par with other gift basket companies. 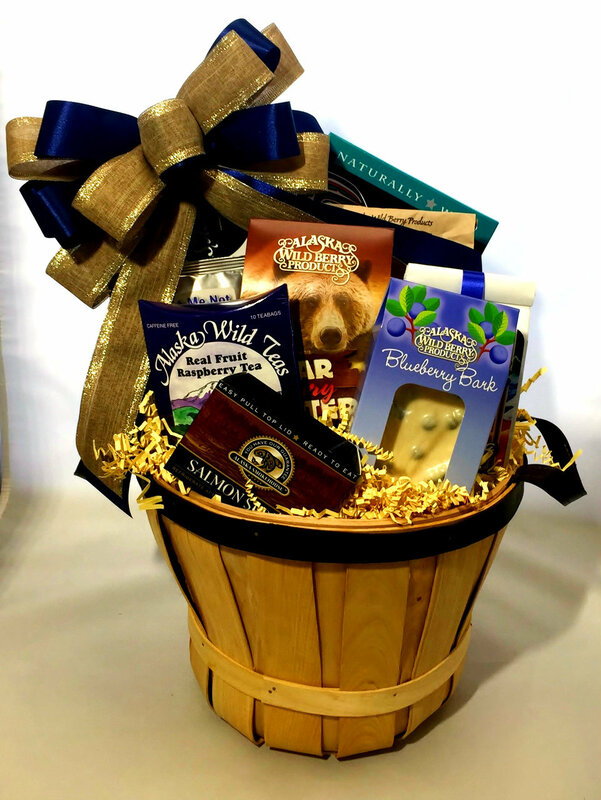 They have five Alaskan-themed gift baskets with chips, smoked salmon, salmon jerky, and Alaskan herb teas. The only holiday baskets they offer are for Christmas. One could argue that they include Thanksgiving as well, but we will get to that later in the review. Some of the other products present in the other baskets are crackers, sausage, chocolates, and beer brittle. They also offer off-hand things like teddy bears for babies along with bibs, caps, and onesies. The variety of their products is respectable, but their variety with the number of actual baskets is the only thing that concerns me. The Gifted Basket does offer customization to customers. It doesn’t exactly state so on the website, but that’s where we come in to research and let you know otherwise. Feel free to call in (907-522-3553) and outline exactly what it is that you want. Like I said before, The Gifted Basket does include Christmas-themed baskets, and they also offer “Autumn” baskets. Now, you can take these baskets and gift them for Halloween or Thanksgiving easily, but they’re not specifically made for these holidays. Some of their other themes include “Thank You” baskets, “Get Well” baskets, and Baby Gifts. There are no gluten-free, kosher, or vegan options on their site. This plunges their score a little bit, and their general lack of holiday baskets also hurt them in this category a little bit. While there’s no Corporate gift baskets per say, at least, non carrying that particular name, they do have “Thank-You” baskets and other baskets that might fit in well with certain situations in the office. All they need to do is make another tab for corporate gifts—that’s it. They also need to either rename a few of the baskets or make new products and slap on a “corporate gift” name to it. Do they have corporate gift options? Are there special prices for bulk orders? Do they have business team members on-site to handle corporate orders. Their prices are actually a little higher than other companies. Most basic baskets at other retailers cost around $30-$40, and the Gifted Basket’s average cost per basket is more around the $50+ range. We’re talking about a difference of $10 or so here, but the value that you might get at other clubs is much higher. There’s just not as many things included in these baskets to warrant the higher price. With that said, their most expensive basket costs $135. We’ll let you decide whether that extra coin you’ll be paying is worth the special products from Alaska. They do offer USPS priority and express mail. Some other ways to ship include UPS ground, UPS 2-day air, FedEx ground, and FedEx 2-day. If you need your package shipped on the weekends, call them and they will work this out for you. Call them if you want your package delivered on a specific date as well. All of the baskets are beautifully packaged. The “Movie Night” basket comes placed inside what looks like a paper container of theatre-style popcorn. Their Christmas gifts are wrapped especially well, and they actually have quite the selection when it comes to this holiday. There are no extra features regarding shipping a letter or card with the basket. Despite this, their beautifully displayed baskets reward them well in this section. The Gifted Basket does offer returns, but it depends. There is no actual return policy, but if, for whatever reason a product is mishandled in the process of shipping, you would have to call in to diagnose the problem yourself. Also if a particular product isn’t available, they will substitute one of their available products of equal or greater value in. Their phone lines are open from 10am-6pm Monday-Friday, and they have a dedicated email address for anyone that wants to answer any questions. Feel free to phone them at 907-522-3553, or fill out the form on their site to answer any questions. Under $50 – There’s really not too many gift baskets in this price range. They have a variety of knick-knacks under $30 like balloons, candles, and scarves, but they only have a few baskets that are below the $50 price point. $50 to $100 – This is where most of the baskets can be found. Expect most to be priced around $60-$70. $100 to $200 – There is only one gift basket in this price range, and that’s the Winter Celebration Holiday Gift Basket priced at $135. This retailer is best for those living in Alaska. They’ve blazed a trail into this Alaskan market that many other gift basket companies won’t be able to compete with. We like that The Gifted Basket is based in Alaska. This really cuts out the middle man and puts the retailer closer to those in Alaska for lower shipping rates and great Alaskan-style food. We like that you can customize your own basket as well as the beautiful packaging accompanying the products. We weren’t fond of the higher prices that will get even higher once you factor in the added shipping costs. We also hoped for some better corporate selections for businesses that want to buy something special for their employees. They also need to expand their reach regarding holidays. There are so many holidays to take advantage of, and this added variety would serve them well in the future. 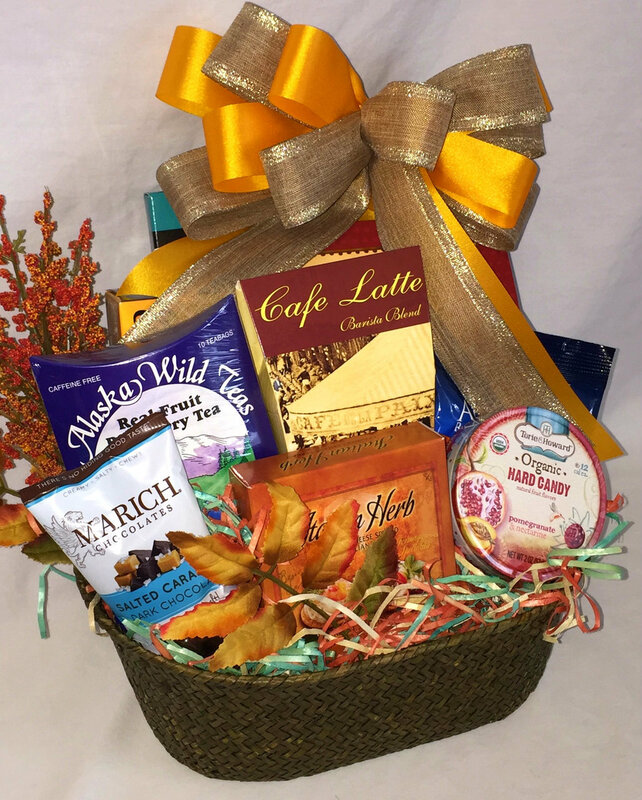 The Gifted Basket is situated in Alaska and offers up some great options including chocolate, crackers, sausage, and Alaskan-style snacks. The Gifted Basket is a great option if you’re living in Canada. They have Alaskan-themed food options as well as other more standard products like candy and chocolate.